What are Socket Head Set / Grub Screws? Socket Grub Screws, also referred to as Grub Screws, Allen Screw or Set Screws, feature a widely used hexagon (or Allen) socket. These can have a high precision machining that allows a general tolerance of 0.13mm - this makes them ideal for high accuracy applications. 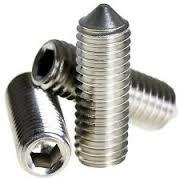 Socket grub screws can be manufactured from a number of specialist materials. Along with the standard A2 and A4 Stainless Steel, These Screws can also be developed out of such materials like Aluminium, Brass, Phosphor Bronze and PEEK. Metric dimentions of these screws range from M1.6 to M16, and lengths of between 2.00mm and 190.00mm. Check the products available above or phone if you need other sizes. Imperial dimentions of these screws range from No. 0 and 3/4 inch. Lengths from 1/16 inch to 4 inch. Again Check the products available above or phone if you need other sizes.